Alexandra Geller is a bright, underachieving fourteen-year-old coming of age in the big hair 1980’s. Alex is from an accomplished, well-educated family. The sudden death of her mother five years ago, and her relationship with her well-meaning but emotionally unavailable father, leaves her unmoored and vulnerable as she tries to figure out who she is. Early in her freshman year, she’s befriended by Paula Hanover, a young, attractive science teacher at her high school. Paula’s irreverence and charm attracts the attention of the girls, who look up to her, and the boys, who have crushes on her. Alex is thrilled to be chosen by this woman and relishes the feeling of finally “belonging” to a mother figure. Paula’s intentions aren’t so benevolent, as she slowly and carefully draws Alex into a relationship designed to meet her own needs, not Alex’s. Desperate for maternal attention, Alex finds ways to ignore the vague sense that something is wrong. Her compelling story sheds light on a common, but rarely talked about kind of trauma which is subtle, and occurs under the radar. 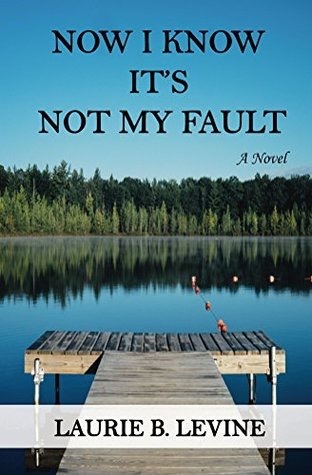 Now I Know It’s Not My Fault chronicles three years in the life of Alex Geller, a fairly typical teenage girl living in the mid eighties in Connecticut. Her mother tragically passed away when she was just nine and the absence of a female role model in her life has left a gaping hole that she is desperate to fill. When she starts high school and makes a connection with one of her teachers, she’s thrilled to have finally found someone who really understands her. Her relationship with her father is strained and as she tries to navigate the painful teenage years, she’s confident that she’s found a friend and an ally in Paula Hanover. From the moment that Alex and Paula meet my radar was pinging and I knew there was something off about the teacher. I wanted to reach through the pages and warn Alex not to get involved with the woman as she just made me uneasy and highly concerned. I’m a thirty five year old woman with life experience though, and it was easy for me to understand why a young and vulnerable girl like Alex was so easily charmed by Paula. Part of Alex’s allure for Paula is her vulnerability, she preyed on her and wanted to be able to easily manipulate her. The storyline of a female abuser gripped me just as much as it sickened me. Levine has created an identifiable and empathetic character in Alex, I had such a strong urge to protect this fragile girl. As their relationship progresses, Paula’s games increase and she is wildly inappropriate in both her actions and her words with Alex. The whole process was called grooming where an individual uses extreme behaviors in order to get what they want. Think moments of high praise and love one minute and stone cold shutting them out the next. It was very confusing for Alex and allowed Paula to satisfy her own needs and wants with no regard for Alex’s needs. Levine is a marriage and family therapist with years of experience working with patients who suffer from trauma and abuse and her insights were invaluable and fascinating. While there were moments that were hard and uncomfortable for me to read, I believe the subject matter is highly important and as a parent, it definitely opened my eyes to a horror I had not considered before. I would say this is an important read for teenagers, especially high school girls, it would even make a really good read for parents to read along with their children and it would open up a conversation that could be impactful. Thanks to Larissa at Claire McKinney PR for my review copy. Just reading your review made me a little sick to my stomach in the horror of the subject matter. I think I need to read this one and share it with my daughters when they get older. So scary! Awesome review!! Hadn’t heard of this one, but the blurb was immediately appealing! It seems interesting and I always feel that way when characters are attracted to those who you feel aren’t good for them!